The material used: powdered herb (root, I most certainly hope, although even this is unclear). This is in contrast to the multiple studies (see below) that demonstrated Black Cohosh's effectiveness for the vasomotor symptoms associated with perimenopause: most of the previous research focused on hydroalcoholic extracts of the root, not powdered root. The dose: 160mg (solo) to 200mg (in combination) daily, barely 1/5 of a gram. If an herbalist told me they were using this dose to help control hot flashes in one of their clients, I'd tell them to go back and study their phytopharmacology. Bottom line: this is a ridiculously small dose compared not only to previous modern research, but also to the tried-and-true experience of Eclectic physicians (see King's dispensatory) who recommend 1/2 to 2 drams (about 2 to 8 fluid ounces) of a 1:1 fluid extract, equivalent to about 2-8 grams (2,000mg to 8,000mg) of raw plant material! Who's doing the research for this new study? Where did they come up with the 160mg daily dose? Although the study author kindly comments that "the trials did not simulate the whole person approach used by naturopathic physicians", this study doesn't even make an attempt to classify the types of women in the treatment group (other than by age and whether they were peri- or post-menopausal). Many other studies are more comprehensive in their analyses, and find that women with "excess estrogen" patterns earlier in life (defined by menstrual history and/or estrogen-dependent breast cancer) benefit much more from this botanical. Its weak estrogen receptor antagonism and its ability to block LH have been hypothesized as possible mechanisms of action (see studies below). So in sum, another poorly-designed clinical trial receievs undue media hype. 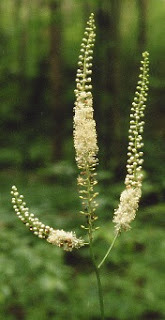 I will most certainly continue to grow and use Black Cohosh in my practice (and not only for hot flashes, which isn't even its most beneficial application). A couple of studies (one from Europe, the other from the Mayo clinic) are included below for further reading.